No Such Person by Caroline B. Cooney. Review: Do you like to read books that keep you trying to figure out what actually happened in the mystery? If so, No Such Person by Caroline B. Cooney is a great book for you. No Such Person can most likely be enjoyed by kids 12+. This book is about two sisters named Miranda and Lander Allerdon, that aren't very close. One summer everything seemed to be normal for them and their family, but Lander is arrested for murder, and soon after that everything went downhill. I definitely recommend this book because it shares both views of the Allerdon sisters which keeps you trying to figure out the mystery. It is also a very unique book that is nothing like I have ever read before. Review written by Molly (6th grade student). We would like to thank Random House for providing a copy of No Such Person for this review. 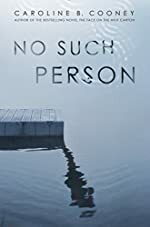 Have you read No Such Person? How would you rate it?